Use or adapt the sermon below in your own preaching or teaching ministry. Text: “Except I shall see in his hands the print of the nails, and put my finger into the print of the nails, and thrust my hand into his side, I will not believe” (John 20:25 RSV). We often judge people by one mistake. We never let them forget it. Further, we never let the world forget it. When we think of David, we think of his sin. We forget what a great man he was in spite of his failure. When we think of Jacob, we think of how he stole his brother’s birthright. When we think of Peter, we remember his denial. Shakespeare said, “The evil that men do lives after them. The good is oft interred with their bones.” This is what happened to Thomas. No doubt he showed great faith many times, but we remember him because of his doubt. Today when someone is skeptical, we call that person a doubting Thomas. In reality Thomas was one of the most steadfast and loyal apostles among the Twelve. How many times we have wrongly judged someone! I. We know that Thomas was skeptical by nature. A. Thomas believed with much difficulty. One day when Jesus was preaching far from Bethany on the other side of the Jordan, his friend Lazarus became seriously ill. In great haste Lazarus’s sisters, Mary and Martha, sent for Jesus to come and heal him. When word of Lazarus’s sickness reached Jesus, he deliberately lingered for two days. The apostles, remembering the threat of mob action on their last trip to Jerusalem, presumed that was the reason. However, at the end of two days, Jesus surprised them by announcing that he was departing for Bethany. They protested, saying, “The Jews of late sought to stone thee; and goest thou thither again?” (John 11:8). Jesus answered, “Lazarus is dead. And I am glad for your sakes that I was not there, to the intent ye may believe; nevertheless, let us go unto him” (vv. 14–15). Thomas responded, “Let us also go, that we may die with him” (v. 16). His comment seems to reveal excessive pessimism. He could see nothing but disaster ahead. Melancholy marked him. B. We must hasten to add that some of the most creative spirits who have ever lived have been of this nature. Georgia Harkness, a theologian and author, described her personal struggle with depression in The Dark Night of the Soul. She told how she came through the valley to find strength and victory in her experiences. In the Scriptures we find expression of this temperament in Job, David, Elijah, and Jeremiah. If Thomas was melancholy, he had plenty of company. C. Again, when Jesus sought to assure the disciples of eternal life, the spirit of Thomas was revealed. “I go to prepare a place for you. And if I go and prepare a place for you, I will come again, and receive you unto myself” (John 14:2–3). Thomas broke in, “Lord, we know not whither thou goest; and how can we know the way?” (John 14:5). Thomas could not accept things without questioning them. He was a realist who wanted to be sure. D. Thomas utterly refused to believe the resurrection. Even after the other disciples told him that they had seen the Lord, Thomas said, “Except I shall see in his hands the print of the nails … I will not believe” (John 20:25). Thomas had to see for himself. He was the last to concede the resurrection of Christ from the dead. Have you doubted? Most of us have. The psalmist cried out, “How long, Lord? Will you forget me forever? How long will you hide your face from me?” (Ps. 13:1 NIV). II. Thomas wanted to believe. There is a difference between honest and dishonest doubters. Some people just do not want to believe. They prefer a life of ungodliness. They make up excuses and blame others as a cover for their own dishonesty. This was not the spirit of Thomas. Thomas wanted to believe. III. Thomas found sympathy from Jesus. 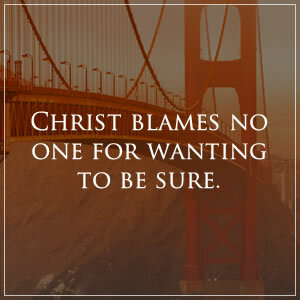 A. Christ blames no one for wanting to be sure. Jesus did not condemn Thomas for his doubts. Jesus knew that once Thomas fought his way through the wilderness of his doubts, he would be the surest man in Christendom. Jesus never says, “You must have no doubts,” but rather, “You must struggle with your doubts until you reach certainty.” Jesus appeared again and said to Thomas, “Reach hither thy finger, and behold my hands” (John 20:27). Jesus spoke to him as a sincere disciple whose faith was weak, not as one with an evil heart of unbelief. Thomas’s answer was immediate. He fell down prostrate at Jesus’s feet and exclaimed with a warm, passionate cry of joy, “My Lord and my God!” His doubts vanished in the presence of the living Christ like morning mist in the sunlight. B. Thomas has given assurance to the world. His confession was noble—the most advanced, in fact, made by any of the Twelve during the time they were with Jesus. The greatest doubter attained the fullest and firmest belief. Thomas declared his belief in the miraculous by proclaiming, “The One who was dead is alive! This One who was crucified has become my Lord!” He acknowledged Jesus as the Christ. IV. Thomas emerged stronger because he doubted. Thomas’s faith became strong and vibrant. Tradition has it that he took the gospel to India. Tertullian said about the early Christians, “No man would be willing to die unless he knew he had the truth.” They would not have died for a dream. They would not have been loyal to a figment of their imagination. Thomas emerged victorious and became faithful unto death in his witness for God. We emerge victorious as we wait on God to reveal himself. Do you have doubts? Keep doing the best you know right where you are. Stay faithful. Keep trusting, following, serving, praying. God will reveal himself. He will show you the nail prints. The Zondervan Pastor’s Annual 2019 gives you a planned preaching program for a full year, including complete sermon outlines for morning and evening services, messages for special occasions, and more. Start saving time in your sermon and service preparation: get your copy today.